Imagine traveling six billion years back in the history of the universe. The Sloan Digital Sky Survey III (SDSS-III) released the largest three-dimensional map of distant black holes and galaxies ever on Wednesday, allowing anyone to take a step into the unknown. Astronomers will now be able to understand the expansion of the universe and start to explain the “dark matter” and “dark energy” which makes up 96 percent of the Universe. “Dark matter and dark energy are two of the greatest mysteries of our time,” said David Schlegel of Lawrence Berkeley National Laboratory, the principal investigator of BOSS, in a statement released by the Harvard-Smithsonian Center for Astrophysics. According to NASA, dark matter could possibly be neutron stars or black holes or particles that scientists have only thought about in theory. Scientists may be able to get a better understanding of the matter that they couldn’t normally see because it doesn’t absorb or emit light, hence the name “dark matter." The map includes data from the Baryon Oscillation Spectroscopic Survey (BOSS) on quasars, black holes that are actively feeding on gas and stars and galaxies, some of which are 12 billion light years away. BOSS is working on mapping these huge galaxies so that they can easily find others. The total volume of the map is equivalent to that of a cube four billion light-years on a side. 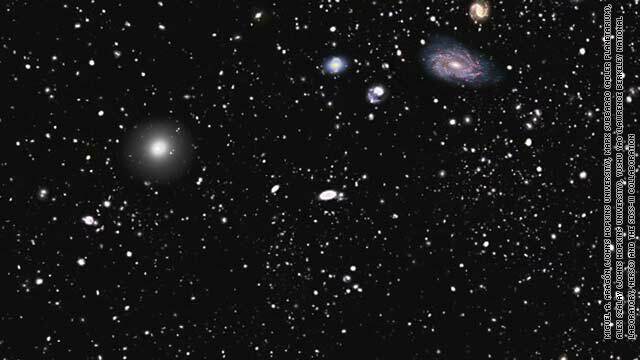 “Our goal is to create a map of the universe that will be used long after we are done, by future generations of astronomers, physicists and the general public,” said New York University Professor Michael Blanton in a statement. Blanton led the team that prepared Data Release 9 (DR9). DR9 began in 2008 and will include the positions of 1.5 million galaxies and 160,000 quasars. The data is available online at the Data Release 9 website for teachers, students, and public. The data will be completed in 2014. SDSS-III also unveiled Data Release 8 last year which contains the largest color image of the sky. The “dark matter” and “dark energy” are the left overs from previous Big Bangs. Galaxies rotate to slow to produce a black hole it did it will destroy it self. When you see a light the source is still active.